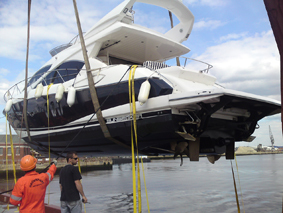 Ipswich Marine will undertake motor yacht deliveries and offers a comprehensive boat cleaning service. Our services cover the East Anglia and the South Coast with offices in Essex, Ipswich, Suffolk, Southampton, Poole and Dorset. Ipswich Marine is regularly asked to provide skippers to assist owners and their families, who may be inexperienced, in becoming accustomed to a new yacht or require help with an extended or arduous voyage. Clients may be considering buying a new or second hand Vessel and need a skipper to carry out sea trials and give expert reports prior to buying. An impartial opinion on a vessel by a highly qualified skipper with many thousands of sea miles and direct knowledge of a vast number of boat designs, can save significant amounts of money in identifying problems that may not be evident to the less experienced eye. Luxury Yacht Delivery by Sea has a number of advantages over other methods of transport. 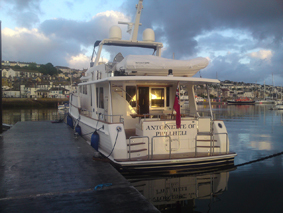 We offer sea delivery direct from the manufactures factory, giving us the opportunity to audit the vessel and often identify and report on problems, which can be rectified before the yacht leaves the manufacturer, or broker and ensures a smooth hand over. Unlike road transport Sea Delivery avoids any dismantling of the Yacht. By delivering a fully assembled boat, the cost, time delay and disruption of dismantling and re-assembly are avoided sea delivery also eliminates lifting the vessel in and out of the water. A Sea Delivery can be used to transfer our extensive knowledge of the vessel to the Owner or the Owners Crew - who will be operating the vessel after the delivery is complete. Other benefits include not having to wait on other people's schedules. We will always discuss with the clients, the most appropriate method of transporting their Yacht. Ipswich Marina, Bradwell marina, West Mersea Marina, Essex Boatyard, Titmarch Marina, Burnah Yacht Harbour, Tollesbury Marina, Fambridge Yacht Haven, Fambridge Yacht Station, Gunfleet Marina, Suffolk Yacht Harbour, Neptune Marina, Tidemill Yacht Harbour, Poole Yacht Haven, Swanwick Marina, Hamble Marina, Salterns Marina, Sutton Harbour Plymouth to name but a few. Ipswich Marine also specialises in luxury boat and motor yacht hire, power boat charters, boat cleaning and offers general boat delivery service worldwide.